Alp d’Huez is the Tour de France most iconic climb, and its frequency and prestige make it the most informative barometer for the sport. Unfortunately, since 2008 when the biological passport was introduced, it’s only featured twice, so the more recent data is thin. 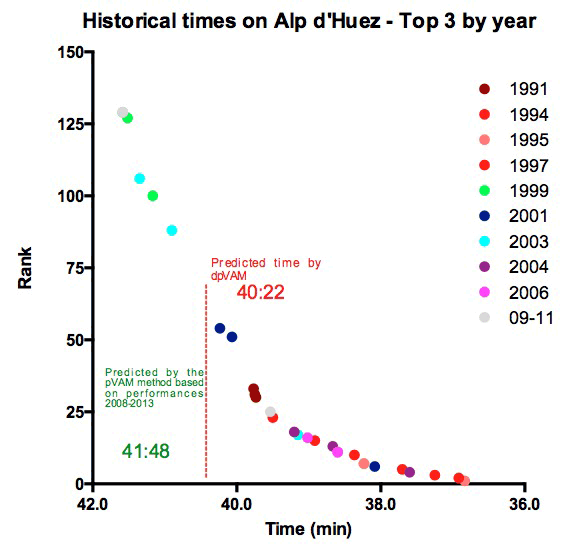 2013 adds two more ascents to the history of Alp d’Huez in the Tour, and in time, this decade will make an interesting comparison to the 1990s and 2000s. Looking back, because it has been a regular feature in the Tour, performance history is so deep that even bad years (too hot, too cold, too windy, too tactical) can be dealt with and the emerging picture of cycling’s “performance barometer” is clearest when looking at this mountain. Below is some historical context to the climb, and my thoughts ahead of its double-inclusion in tomorrow’s 2013 Tour de France. Generally speaking, red shades represent the 1990s, and it’s clear that they’re heavily weighted to the bottom (higher ranking) and right (faster times) of the graph. The fastest performances on the mountain belong, not surprisingly, to Marco Pantani, who has broken 37:00 twice. He also occupies third place, and only then do the performances of Armstrong, Ullrich, Indurain, Zulle, Riis and Virenque feature. The implication of this is that Pantani was finishing 200km stages with faster ascents than the ITT of 2004, which is quite astonishing (the 2004 ITT was hot, but not exceptionally. I can’t vouch for the conditions during those Pantani ascents). 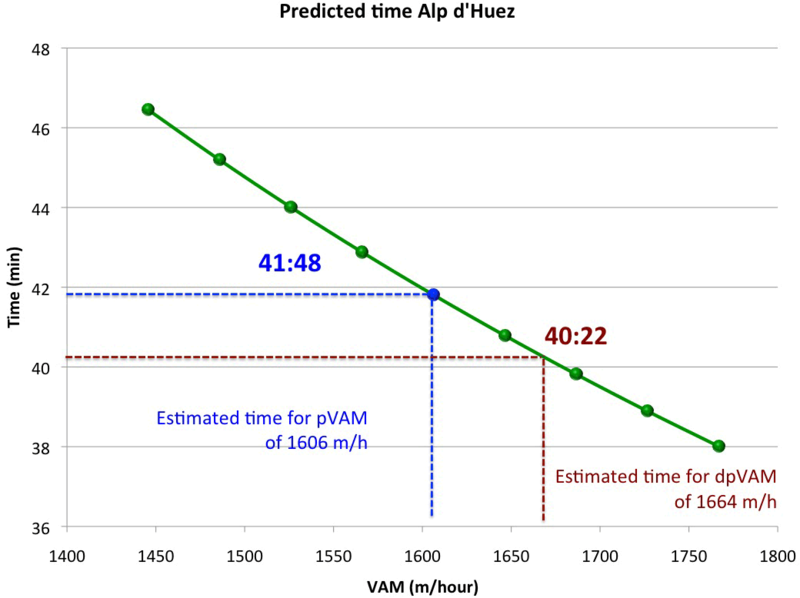 pVAM for Alp d’Huez is 1606 m/hour, giving a predicted time of 41:48. That actually lies to the left of the data set in the above graphs, as it is slower than the 140th best time in history, which provides some perspective on what the doping eras of the 1990s and 2000s provided. The dpVAM is indicated as 40:22 (VAM = 1664 m/hour), which would be good for 64th on the all-time list. The mountain-top finishes of the 2013 Tour have been dominated by Chris Froome. When using the pVAM and dpVAM method of comparison, Chris Froome is the only cyclist who has finished faster than the predictions on both climbs. Remember that this prediction is nothing more than a standardized, objective method of evaluating climb performance using historical benchmarks – the implications of being faster or slower than the prediction can be discussed separately. All that matters for now is a relative comparison between different riders of the 2013 race against this benchmark. On Ax-3-Domaines, Richie Porte joined Froome under the historical “undoped” benchmark , whereas Mont Ventoux saw ten men go faster than pVAM (that suggests favorable conditions on the day). Nobody other than Froome has been faster than the dpVAM prediction in either finishing climb this year, and he did it on both climbs. 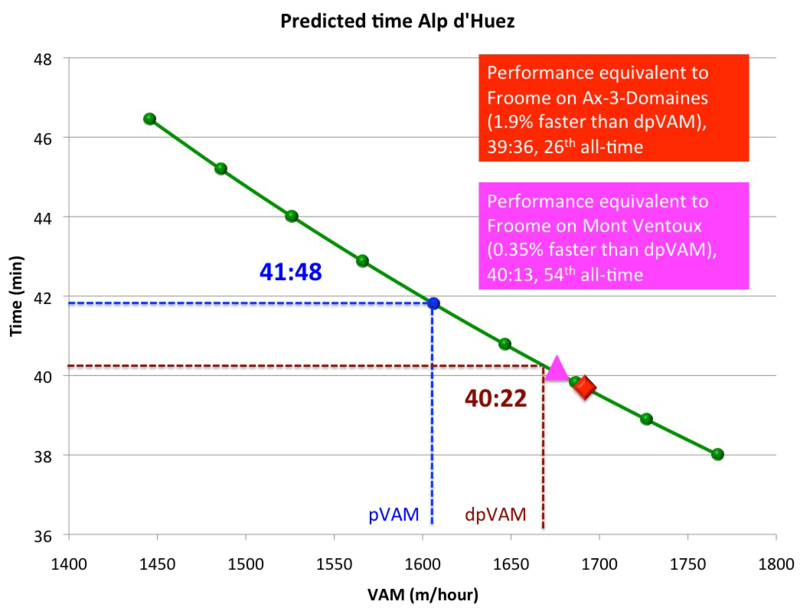 If anyone is able to produce a performance like Froome’s on Ax-3-Domaines or Mont Ventoux, then expect a time slightly faster than the dpVAM, which is 40:22. They may just crack 40 minutes, which would sneak them into the top 50. In order to get into the top 20 of all-time, a performance faster than 39:15 would be required. That would be 2.8% faster than the dpVAM, the prediction made based on times from the known doped era. 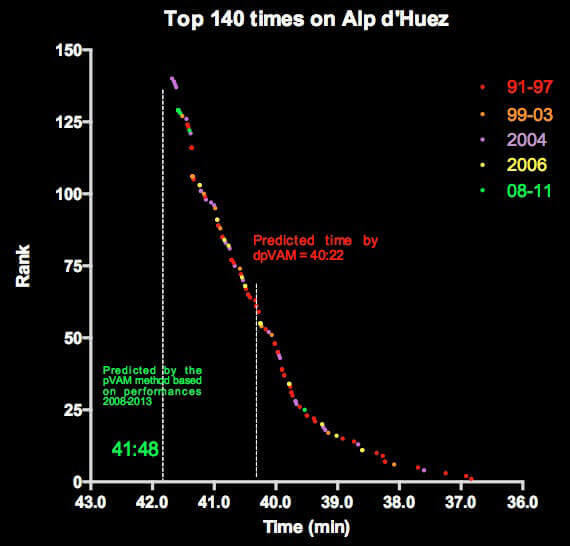 So far, Chris Froome has been 1.9% and 0.35% faster than dpVAM on Ax-3-Domaines and Mont Ventoux, respectively.The figure below shows where Froome’s performances on those two climbs would be expected to feature were he to produce them again on Alp d’Huez.The red diamond corresponds to Froome’s Ax-3-Domaines performance – it is 1.9% faster than the prediction from the doped era. The pink triangle is a performance corresponding to Froome on Mont Ventoux – 0.35% faster than dpVAM. Those same performances on Alp d’Huez would be good enough for 26th and 54th on the all-time list. Clearly, Froome’s performances on those climbs, impressive as they were, are placed into context when held up against the Tour’s deepest and most extensive benchmark. That’s been part of the difficulty to date – I called it “performance pixellation”, when isolated performances are viewed, well, in isolation. The deeper the data goes, the better the insight gained, and that applies to the mountain as well. That’s why this entire exercise, and that of the Doc at the veloclinic, are about the process, not proof . This is a point I’ve tried to emphasize many times , but the message sometimes doesn’t get through. Hopefully Alp d’Huez adds some more perspective to help this argument along. 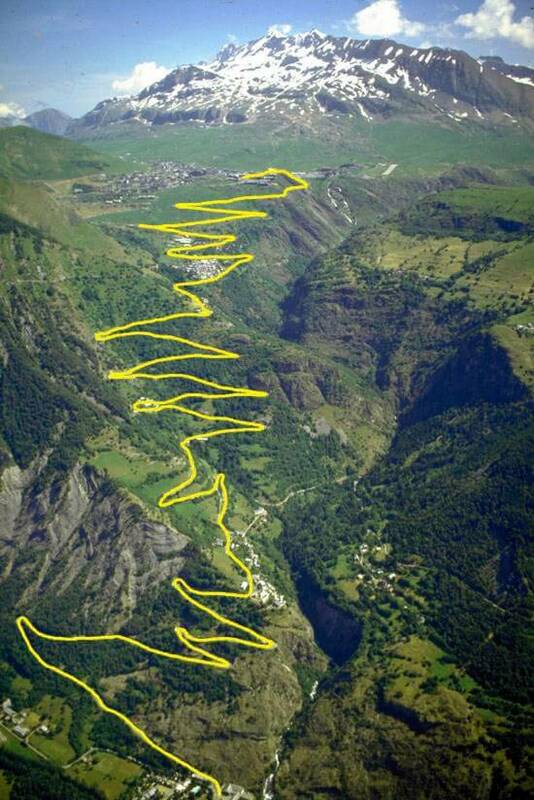 That said, the tactical situation of the race may confound the Alp d’Huez ascent this year. Much like the situation on Mont Ventoux, Chris Froome can afford to be relatively conservative, and pick a moment later in the climb to attack, if at all. Last Sunday on Ventoux, he attacked with about 7km to go, producing a furious acceleration off what was a relatively cautious first half of the climb. The same on Alp d’Huez would skew the eventual time – David Brailsford alluded in an interview to the fact that their data suggest Froome could have been even faster, something that was obvious just looking at the pacing strategy on the climb (the other riders provide the barometer for the pacing). Given that he does not need the time, Froome may do the same tomorrow, so we will wait to see what the performance means in the grander, historical context. Also of interest will be the double ascent, to see just how much more slowly they ride the climb the first time around. 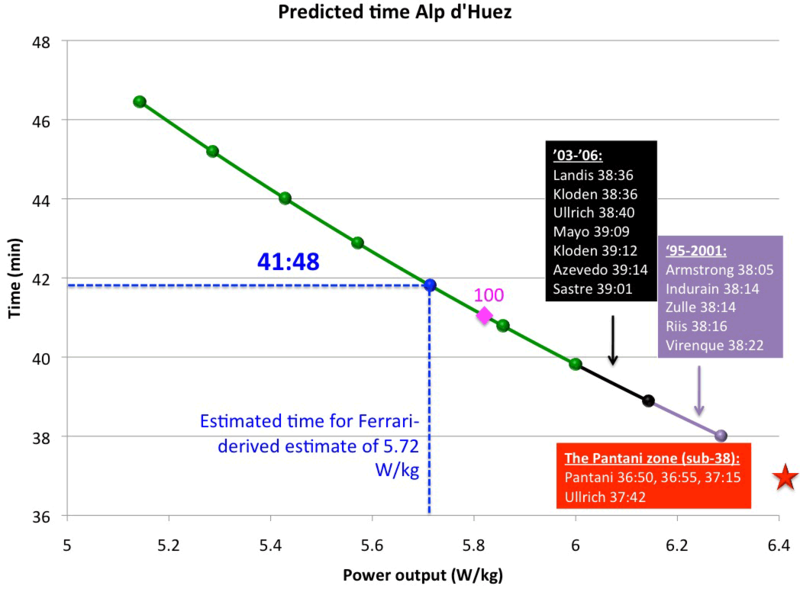 I’d be surprised if the main peloton breaks 46 minutes the first time (that projects a power output of about 5.1 W/kg using Ferrari’s method). An early break, which is inevitable, could well gain 3 to 4 mins within the 21 hairpins of the climb. And finally, the weather forecast, in keeping with the individuals time-trial I’m watching as I write this, is cold and wet. That introduces an interesting variable, because different riders tolerate changes in temperature, and also colder temperatures, far worse than others, so the ascent of Alp d’Huez may throw up a few surprises. The analysis and thoughts to come, particularly on Facebook and Twitter , so do follow me and then join me tomorrow for what should be a tremendous day on cycling’s greatest stage.